The Huber Heights Mayoral Debate was 6:30 April 20th at Weisenborn Middle School. 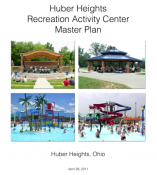 I missed the first 30 minutes because I went over to the Parks and Recreation Committee meeting to hear the discussion on the Parks and Rec Master Plan. The part of the debate I saw was a good reflection on the LWV's and I am glad they did the work to put on this event. As always though, it would be nicer if these events drew in more residents. If like me, you missed all or part of the debate, here is one of the videos posted by attendees. I am glad these are available and we get the opportunity to watch. On issues in front of council, the current Mayor’s positions agree with the positions of the most influential member of council at least 90% of the time. Over the last three years they have disagreed on the way new TIF districts should be implemented, the advertising strategy for the income tax levy, the amount of supplement provided to the developer of Carriage Trails, and the awarding of no bid contracts to friends. They hold polar opposite views on the value of open discussions on issues. The mayor believes it is useful for the public to see the points given that convince other council members to support a project. The influential council member believes in going behind closed doors and fighting it out privately which results in the public hearing one voice. Though you won’t find any newspaper articles that explain any of these issues and why there was disagreement, you can find articles around the times of these disagreements proclaiming council thinks the mayor is mean. Since it is highly likely the influential member of council will still be on council after you become mayor, and it is highly likely that the claim he made to me, that he has spent about $400,000 advertising his business, will still be true during your term. Do you advocate going back to the policy of creating TIF’s that funnel 70% of school money to the city, locking the manning of our police and fire departments at current levels, and reintroducing $18,000 supplements to the fastest growing development in Southwest Ohio just to keep from seeing articles designed to make you look bad? A key finding of the studies performed in developing the Brandt Pike Revitalization Plan is the city has 30% more commercial properties than necessary. This overage will increase with the development of “The Heights” on Executive Blvd. Though initially sold as a plan to address all of the commercial properties along 202/201 South of Taylorsville Rd, as the title indicates, that inclusive concept was abandon soon after it was approved by council. It was replaced by a narrow vision proposed as the solution long before the first dollar was spent or first survey question constructed. We see from the initial briefings the first phase of the plan will be a recommendation to spend government dollars to improve the commercial property around the intersection of Brandt Pike and Chambersburg. In an already saturated market, how much of the taxpayer’s money should the city be spending in order to give the owners of run down shopping centers a competitive advantage, over the owners of complexes, who have made a financial commitment to the City by renovating their own properties, such as the owner of Imperial Heights, found on Old Troy Pike,? The city has already spent $170,000 to design a high-pressure zone North of I-70. The estimated cost for the completed project will be $2.5 million. The Ohio plumbing code states that if the pressure to a house exceeds 80 psi then a pressure reducing valve is required. Allowing the pressure in a house to be above code reduces the life expectancy of the plumbing system and appliances. Facets, toilets, dishwashers and washing machines that typically last 12 to 15 years are likely to develop leaks in 3 to 8 years. Home piping that typically goes 60 years without a line break can degrade in 25. Studying the updated pressure zone model, we see that after all scheduled work is completed, the average pressure to houses in the high-pressure zone will be 80 psi. This means there will be houses in this area with pressures over 80 psi. To date the city has not tried to identify how many of the 2000 houses in the area will have their water pressure increased to a level above 80 psi. Would you recommend going ahead with the project without this knowledge expecting those affected to fend for themselves? During the discussion on this project one council member justified spending the $2.5 million dollars because 28 residents in a three-year period complained to the city about low water pressure (note: though council has not investigated any of these houses to find out their current status, the City Engineer tells us that about half the time he investigates complaints like these it turns out to be a problem with the house’s water softener). There was also some discussion that this project might benefit a business or two on executive blvd. Though when pressed staff tells us there is no business currently in this area requesting this upgrade and no other prospective business identified planning to located there. Do you support spending money on projects with this level of due diligence? Currently, if city council passes a resolution that citizens do not agree with, citizens can organize, put together a petition and if they can gather about 1600 signatures challenge that legislation at the ballot. Issue 11 takes that right away. There are people that want to hide this fact with the claim that all the amendment would do is clean up the language. 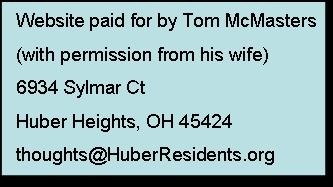 The Huber Heights City Attorney’s written assessment provided for our Jan 23 council meeting should have put a stop to this claim: "While resolutions take immediate effect now, until the changes in this round of City Charter amendments are approved by the voters (if they are), resolutions will still be subject to referendum.". Do you advocate for or against residents having the right to challenge council’s actions through a ballot initiative? Earlier this year council was told of a grant that would make it possible to hire three additional firefighters for approximately $110,000 a year for the each of the next three years. At the end of this period the total cost would be about $300,000. At that time the city would have to decide to either keep the higher manning levels or go back to the lower levels by not replacing older workers expected to retire about this time. The city manager indicated he was concerned the city would not be able to afford the $110,000 a year and would return at a later time to council with a summary of the financial ability of the City’s General Fund to support the hiring of these emergency personnel. Since that time the city has committed to spend an additional $50,000 from the General Fund for an electronic billboard, an additional $20,000 to produce two mailers, an additional $43,000 to start a comprehensive parks plan that will take an additional $30,000 to complete and likely would take $2 or $3 million to implement. Would you fund these types of expenditures before being presented the financial impact on the ability to take advantage of a grant that would make hiring emergency personnel this affordable?